The UK government has pledged to get another one million people online by 2012 as it pushes ahead with moving the majority of its services onto the web. It has announced a £30m cash injection for UK online centres, set up nine years ago to provide help for those without internet access. The government wants to get "the majority" of its services online in the next five years, Gordon Brown said. It is estimated that around 10 million Britons have never touched a computer. Of those, four million are regarded as socially excluded as well, with many using government benefit services. The issue of digital exclusion has slowly been creeping up the political agenda as the government recognises the link between poverty and lack of access and sees potential for substantial savings by putting key services online. In a speech at the Royal Society of Arts this week, Prime Minister Gordon Brown said: "Our aim is - within the next five years - to shift the great majority of our transactional services to become online only. This has the potential to save as a first step £400m but as transaction after transaction goes online billions more." "But in order to achieve our ambitions for this third generation of public services we must ensure that no-one in Britain is left behind....We will invest a further £30m with UK online centres...to get at least another one million people online by 2012." A report commissioned by the UK's digital inclusion champion Martha Lane Fox found that the overall economic benefit of getting everyone in the UK online added up to £22bn. Calculations by Price Waterhouse Cooper found that getting the digital excluded online and making one transaction with government services each month would save £900m annually. Martha Lane Fox was pleased that the government had taken heed of the problem. "There is both a moral and economic imperative for the wider community to take the issue of digital inclusion much more seriously," she said. Some two million people are estimated to currently use UK online centres, which were set up in 2000 to tackle the digital divide. The 3,500 centres around the UK are operated by the voluntary and community sector and can be found in a range of venues such as libraries, schools, mosques, community centres and sheltered housing units. 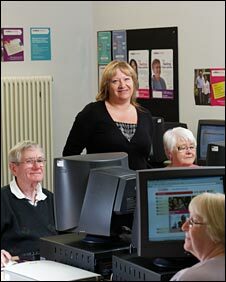 Helen Milner, managing director of the centres was delighted by the news of more cash. "It's the best Christmas present I could possibly have wished for the sector, and in particular for the grassroots practitioners who will see the vast majority of this funding," she said. Three-quarters of the money will go into extending the service in existing centres and offering grants for new ones. The rest will be used to market the services within the communities they work, explained a spokeswoman for UK Online Centres.